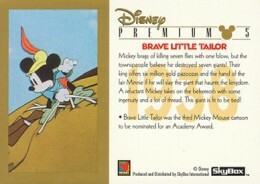 With much of the hobby headed in a more high-end direction, 1995 SkyBox Disney Premium trading cards went in a similar direction. Although the cards are attractive, it never really caught on. The cards may cost a little more than many other Disney sets, but it's by no means expensive today. 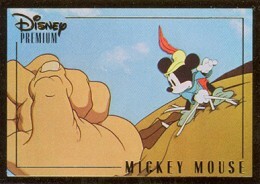 1995 SkyBox Disney Premium has an 80-card base set. Card fronts stand out with thick gold foil borders. The name, logo and thin inner border are also done with gold foil. Adding to the high-end feel, at least for the time, is thicker card stock. 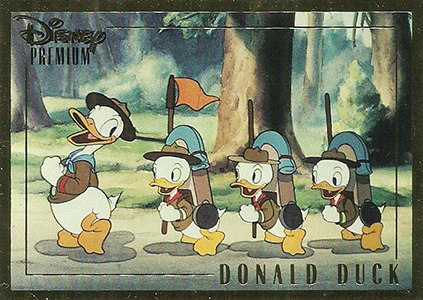 The first 65 cards in the set use Disney's rich history of animated shorts. Most fronts name the pictured character while the back gives a write-up about the short it comes from. There are also subsets for posters and cover art, and a pair of checklists. Chase cards are interesting. They're actually numbered as part of the base set. In that regard, they're more like short prints than traditional inserts. Silver Screen cards are done in foil and spotlight villains. Carrying over a trend from the sports card realm at the time, the cards are covered with a protective clear layer that can be peeled off. The set has nine cards and are inserted 1:4 packs. 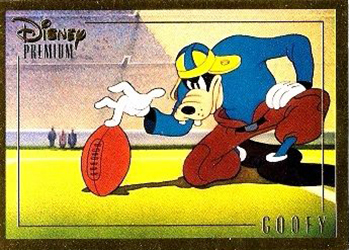 1995 SkyBox Disney Premium also has a pair of Holobossed cards to close out the checklist. Inserted 1:18 packs, these are basic holograms with a slightly embossed color group shot on the front. Sealed 1995 SkyBox Premium boxes come with 36 packs of six cards. 9 cards. Inserted 1:4 packs. 2 cards. Inserted 1:18 packs. Disney Premium 1995 Skybox 80 Trading Card Set Uncut Press Sheet Rare! Disney Premium 1995 Skybox Silver Screen Chase Card Set Uncut Press Sheet Rare! 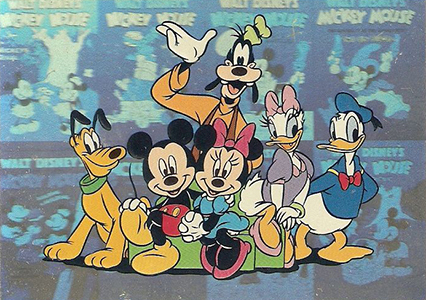 Disney, 1995 - "Premium - Trading Cards" - "Complete" - "(80) Card Base Set." 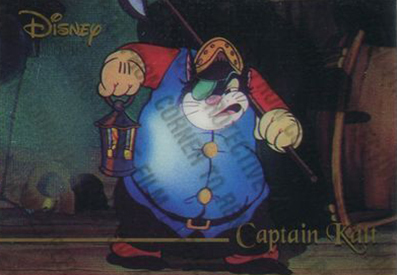 Disney's, 1995-Premium Trading Cards - "Silver Screen" - Subset Chase Cards Set. looking to see what they are worth? Hi I have Skybox trading cards partial snowwhite collection some have walt drawinf and some sketches all are in good condition are they worth anything. been opened and 4 that have been – probably in the 1990?